There are many ways in which you could arrange your wedding – but planning for September weddings when both the bride and grooms families could be described as ‘stone mad’ for hurling, well, it just adds another layer of complications. And what if the wedding was on today, in Clonmel, between Erraine’s lovely sister and her fiancée? Options could include changing schedule, arranging for a choir to learn the words to the most magical song “Tipp, Tipp, Tipp“, getting your sister to come back from Brussels (giving a certain advantages to the All Stars), and carry on with things. 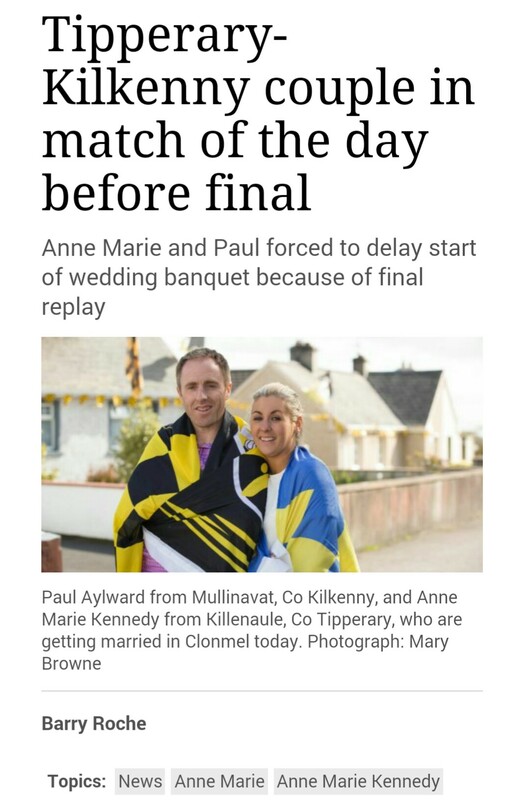 Today’s Irish Times features the happy couple and their plans for today’s festivities. And the most important fizzy thing? That won’t be the champagne, but local boy and Tipp player Bubbles, who has been forecast by Anne Marie to score the winning point (for real this time, da*n you Hawkeye). We’d like to wish all the best to the Kennedy and Aylward families; and really hope that the post-match wedding celebrations aren’t marred by the final result, come what may. Love (and hurling) conquers all.